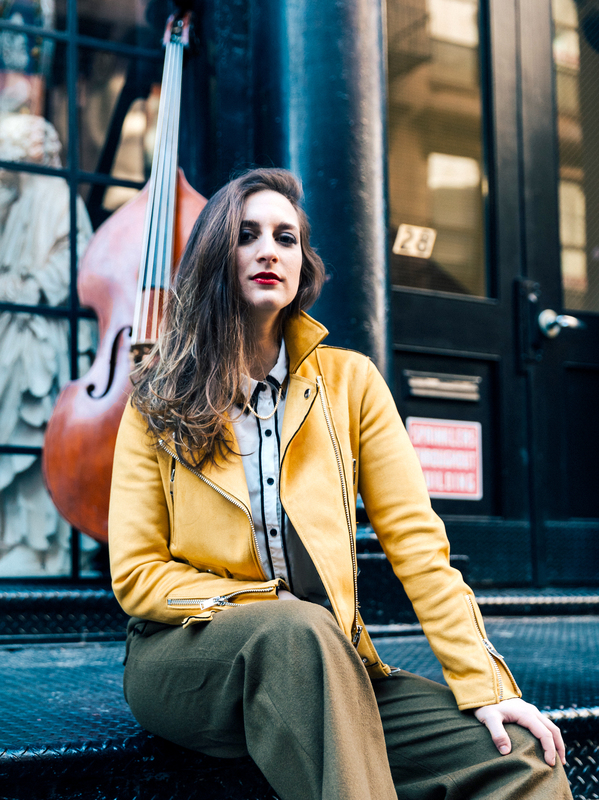 In 2012, bassist Adi Meyerson emigrated to New York from Jerusalem to further her studies at The New School for Jazz and Contemporary Music. Six years on from that life-changing move, her debut album Where We Stand draws heavily for inspiration from her adopted home, where she continues to establish herself as a vital presence on the jazz scene. Anyone coming to the set anticipating wistful homages to the land where she grew up (she actually was born in San Francisco and moved to Israel when she was two) will be disappointed: Where We Stand oozes New York from every pore, so deeply rooted is it stylistically in long-standing traditions associated with the city. As this inspired set plays out, connections arise not only to the classic Blue Note tradition of the ‘60s but bebop, too. Where We Stand is anything but a tired retread, however; throughout the recording, Meyerson demonstrates a special gift for making hard bop sound new and fresh all over again. She’s helped immeasurably in that regard by those joining her on the date, tenor saxophonist Joel Frahm, trumpeter Freddie Hendrix, pianist Mike King, and drummer Kush Abadey, each of who brings energy and conviction to Meyerson’s material; adding to the album’s appeal, vocalist Camila Meza guests on two of the ten tracks. Frahm’s in particularly voluble form on the date, while Hendrix is similarly extroverted, the trumpeter preferring a brash attack over a subdued purr. Meyerson’s playing is consistently on-point and assured, as are the performances of King and Abadey. Indicative of the album’s tone, “Rice & Beans” sounds uncannily like the kind of material Tony Williams was producing during his late Blue Note period; to that point, it would be easy to imagine the tune slotting itself cozily onto 1988’s Angel Street without anyone batting an eye. The scene-setter swings mightily, with Frahm, Hendrix, and King setting the bar high with exuberant, succinct solo statements and Meyerson and Abadey powering the material with muscularity and poise. Though it might seem like a sideways nod to Ellington, “A “D” Train” was so titled to help people pronounce Meyerson’s name correctly. Regardless, the brisk bop-inflected workout sees the unit barreling through the changes, rarely pausing for breath. Similarly high-spirited, “TNT” might have you thinking you’ve been airlifted back to the early days of Birdland with Dizzy roaring through “Salt Peanuts” to a suitably stunned crowd. Throughout this stellar debut, Meyerson distinguishes herself as a sure-footed player and composer possessing a natural talent for extending blues-bop writing into the present day with strong melodies and arrangements. As impressive is the ease with which she tackles concurrent contemporary styles as well as those associated with jazz’s long history. Who: Though I was born in San Francisco, I moved to Israel when I was two and grew up in Jerusalem. I currently live in New York where I’ve been for six years. I first got into music when I was fourteen and started playing electric bass at my school with the music major kids. I seriously got into jazz when I was about eighteen and was given a Sonny Rollins record. Then I started to play upright bass to get the ‘jazz’ sound I was hearing on the record. After that I studied in Tel Aviv and continued my degree at the New School and studying privately. What: Mainly jazz but honestly anything good that comes my way. Currently: I’m writing some new music for a couple projects I have in mind, one on electric bass with a string quartet. Musical philosophy: Create honestly. Honest music is usually good music. Favourite artists and strongest influences: Oh, that’s a hard one. There are so many, I feel like a little bit of everything that I listen to somehow influences my music. Lately it’s been Alice Coltrane, Charles Mingus, and Ron Carter. Recordings I return to repeatedly: Nancy Wilson/Cannonball Adderley, Miles Davis’s ‘Four’ & More, and the Ahmad Jamal Trio’s Cross Country Tour: 1958-1961. All these records are pretty much perfect from beginning to end and have all influenced me in a certain way. A memorable event, concert, or experience: My senior recital in high school. I remember feeling like this was only the first one and that this what I want to do for the rest of my life. That’s pretty much when I decided I wanted to be a professional musician.